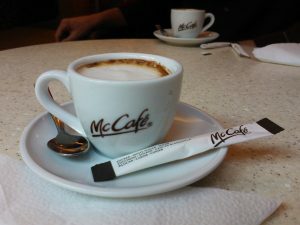 Issue One would put an arbitrary cap of $500,000 on non-economic and caps punitive damages. In real life this means that if a 40 year old successful business man is killed negligently then his life could be worth millions because you could calculate his current earnings and multiply them out for the future. 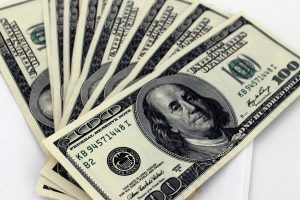 If a stay at home mom, a child or infant, a retired veteran, an individual with Down Syndrome or other genetic disorder who isn’t employed or a nursing home resident who dies as a result of abuse or someone else’s error or negligence then those lives are all capped at a value never to exceed $500,000. The jury simply can’t award a family more, even if it wanted to do so. Think of your loved ones, would you ever put a price tag on their lives? Ultimately, Issue One says that some lives are more valuable than others. It says that your life’s value is determined by your what you earn at the time of a tragedy. It says that Arkansans on juries can’t hear the facts and award a family $1 million dollars for the abuse of their child who was left brain damaged or the neglect of their elderly mother in a nursing home. Issue One is one more step in devaluing life in a culture where we simply can’t afford any more slips down that slope. Family Council Action Committee announced a few weeks ago that it would campaign against Issue 1, because the amendment puts a dollar value on human life. We have written in the past about the unintended consequences of measures like Issue 1. Family Council has never opposed responsible lawsuit reforms. As far back as 2003, we did not oppose general malpractice reform measures passed by the legislature. That same year, however, we did oppose a proposal that could have given an unfair advantage to nursing homes over good care for residents. Some nursing home owners simply don’t want to spend the money necessary to provide quality care. They cut staff, reduce services, compromise care, and let people suffer. Most families have a story about a loved one who was neglected or mistreated in a nursing home. The fear of a lawsuit may be all that keeps some nursing homes in line. Issue 1 removes that threat. If that goes away, our elderly nursing home residents will suffer even more. You can read the entire op-ed by Rose Mimms here. The following announcement is from Family Council Action Committee. AARP is showing a free movie that sheds light on lawsuit reforms like Issue 1, a proposed state constitutional amendment restricting the amount of money awarded in injury lawsuits. Family Council Action Committee opposes Issue 1, because it puts a price tag on human life. The amendment caps noneconomic damages in cases of injury or death at $500,000. Under Issue 1, $500,000 might be the only penalty a preschool would face for leaving a child locked in a hot car on a summer day. $500,000 might be all a nursing home would pay for causing the death of an elderly grandmother. Family Council Action Committee is teaming up with AARP to help Arkansans better understand the consequences of Issue 1. AARP will show the movie Hot Coffee at different locations around the state from April to June. Hot Coffee is an award-winning film that explains how lawsuits easily can be misunderstood. It also highlights the unintended consequences of lawsuit reforms. After the movie, a licensed attorney will be available to answer questions and provide more information. You are invited to come watch the movie free of charge; please RSVP in advance to let AARP know you intend to be there. You can find movie dates, times, locations, and RSVP information below. You can watch a preview for Hot Coffee here. The following is a press release from Family Council Action Committee. You can see video of Family Council Action Committee’s press conference here. 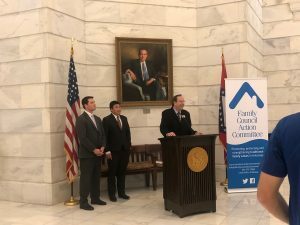 At a press conference on Monday, Family Council Action Committee formally announced its opposition to Issue One, a proposed constitutional amendment restricting the amount of money awarded in lawsuits. Cox said Issue One treats young children, elderly adults, and others who do not earn an income as if their lives are not as valuable as everyone else’s. “This amendment sets the going rate for people killed or injured due to the negligence of others. Retired husband or wife: $500,000. Homemaker with four young children, but no outside income: $500,000. Mentally-disabled child: $500,000. Family man on disability: $500,000. But wealthy wage earners are treated better. They could collect millions of dollars in economic damages because of projected future earnings and lost wages. “Currently, any resident of a long-term health care facility who is abused or neglected can take the case to court. This goes for all other injury lawsuits, as well. There, a jury of everyday Arkansans hears the facts of the case and then awards damages based on what they believe to be fair and just. This jury system is a guaranteed constitutional right enjoyed by every person. After all, everyone who needs it should have their day in court and expect justice. Issue One is an insult to justice. Issue One ties the hands of judges and juries by letting the State set an arbitrary, one-size-fits-all value of no more than $500,000 in noneconomic damages,” Cox said. Family Council Action Committee Political Director Ken Yang rolled out a seven-point plan for defeating Issue One. The plan includes rallying faith leaders, mobilizing a statewide grassroots network, a direct mail and social media effort, conducting speaking engagements, earned media, voter’s guides, and a get-out-the-vote campaign. Family Council Action Committee is a conservative 501(c)(4) organization based in Little Rock, Arkansas. *Based on published annual averages. Family Council is a conservative education and research organization based in Little Rock, Arkansas. Our mission is to promote, protect, and strengthen traditional family values found and reflected in the Bible by impacting public opinion and public policy in Arkansas. Our site uses temporary cookies in order to track user behavior on our website.